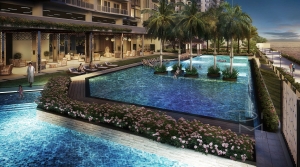 Oak Harbor Residences is the soon to rise resort type mid rise condominium by the bay , another quality development from the Triple AAA builder in the Philippines – DMCI Homes. Oak Harbor Residences is conveniently located at Jackson Avenue, Asiaworld City, Brgy. Don Galo, Marina Bay, Parañaque City, Philippines. Enjoy the view of the most beautiful sunset of Manila Bay right in your own home. Living in a resort-type condo community is your reprieve from the stressors in the city. Oak Harbor Residences is situated near to business districts and establishments such as SM Mall of Asia , Solaire Resorts, City of Dreams, Pagcor Entertainment City, Solaire Resorts and Manila Resorts World Bayshore and Aseana City. Oak Harbor Residences is situated near to business districts and establishments such as SM Mall of Asia , Solaire Hotel and Casino, City of Dreams, Pagcor Entertainment City, Solaire Resorts and Manila Resorts World Bayshore and Aseana City. Experience the luxury of having a peaceful and quiet vacation at home. Oak Harbor Residences is truly a Great Investment!! !